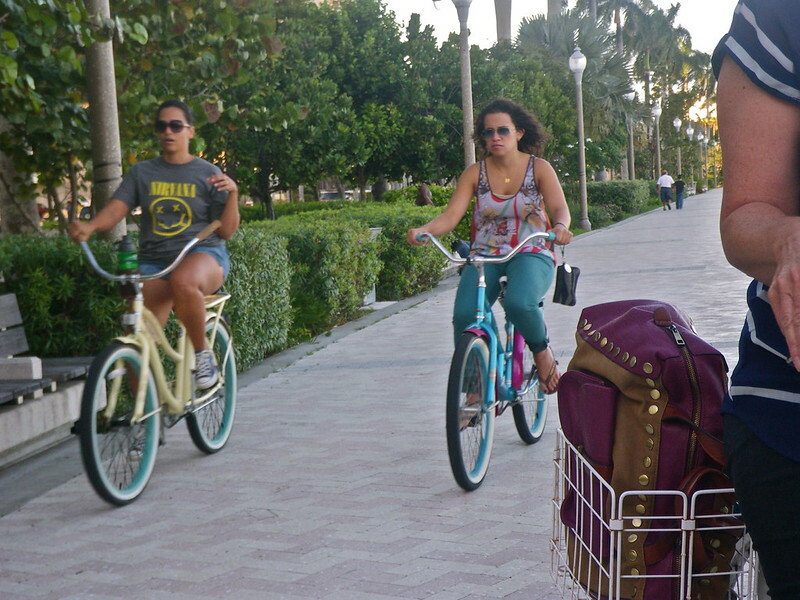 Protected Cycle Track from Palm Beach Cycle Chic on Vimeo. 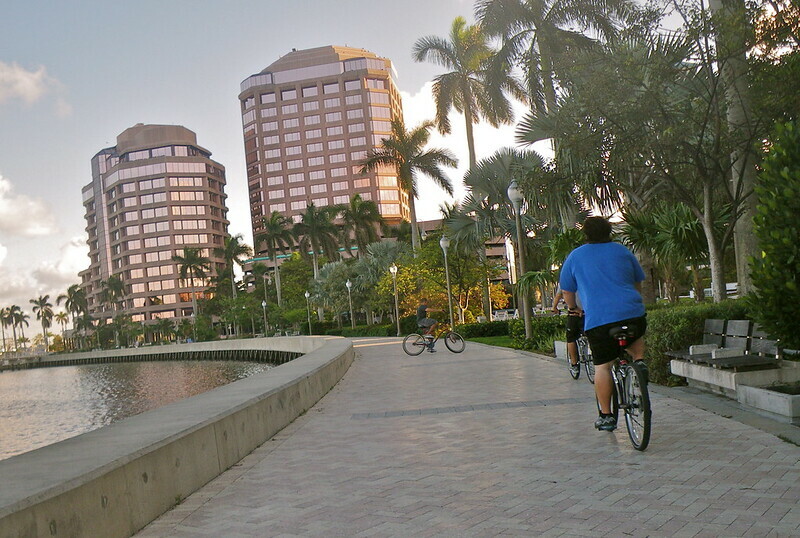 Cycling in West Palm from Margarita Yerastova on Vimeo. 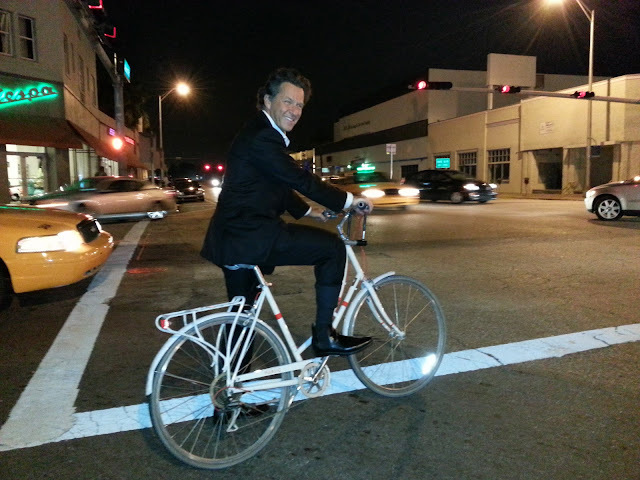 Raphael Clemente is our Executive Director at the Downtown Development Authority and he is one of our best cycling advocates, having been a professional racer. He even lived in the Netherlands for 2 years racing bikes so he knows first hand the wonders of a cycling country. 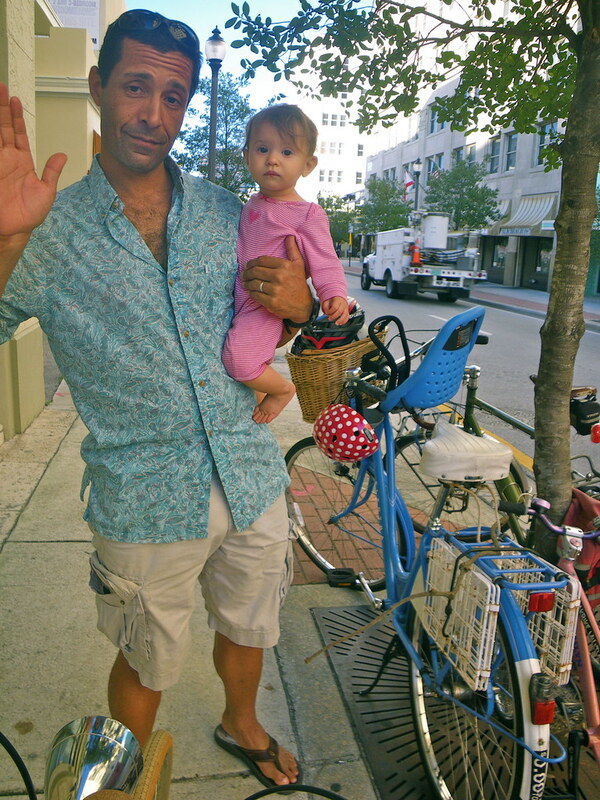 He caught me riding around town and I rode around with him and his family for a while. He had his 2 kids with him and he was carting his bike while riding his wife's Electra Amsterdam, all on their way to pick her up so all could cycle home. 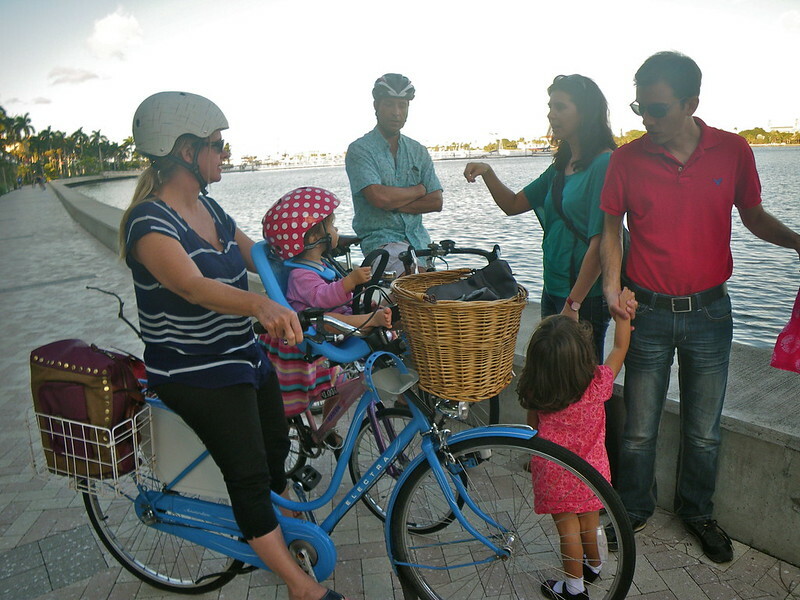 They are a lovely cycling family and his children grew up on 2 wheels. 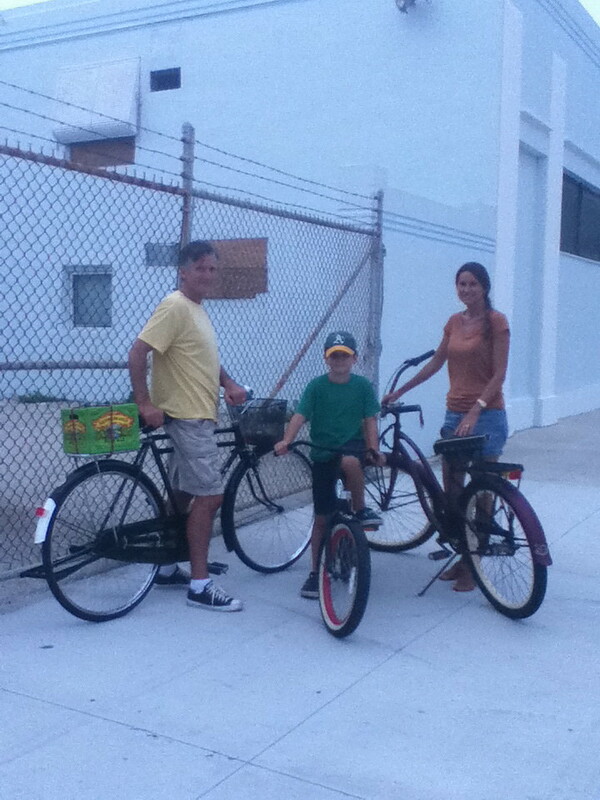 They cycle to school, to Publix, even to Home Depot with his trailer that attaches to his bike. He wants to get either a cargo bicycle like a Yuba or a Surly, or give in and get a bakfiets so he can really truly haul anything and everything in it. He would be the first I've ever seen around here with a bakfiets. 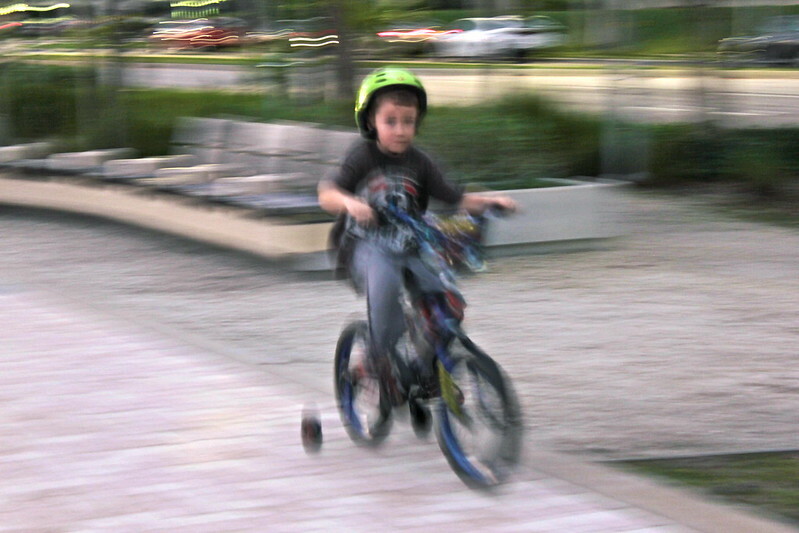 He is amazingly skilled at cycling and tries his best to advocate for safer streets in our neighborhood, usually all by himself fighting for cycling accomodations before the Commission. Before Bret Baronak became our MPO, he had this position for 4-5 years and finally quit once he gave up trying to fight with the county engineers to fix our roads and account for cyclists and pedestrians, but they are very car-centric. 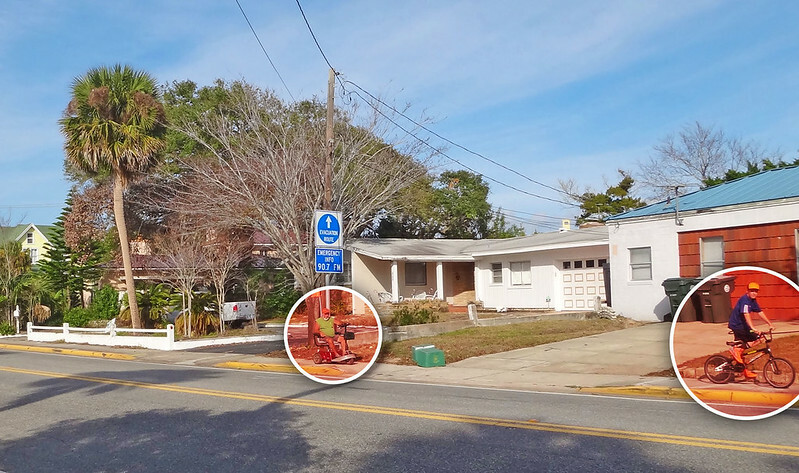 George T. Webb and Steve Carrier are the very engineers who are anti-anything-not-in-a-motor-vehicle in West Palm Beach and they don't care that they are stifling neighborhoods and progression. They don't care that they are causing the County to lose jobs and creative people moving to friendlier places with better transportation options. They only care about pouring millions of dollars into asphalt because that's all they've ever known and it's already last-century thinking. 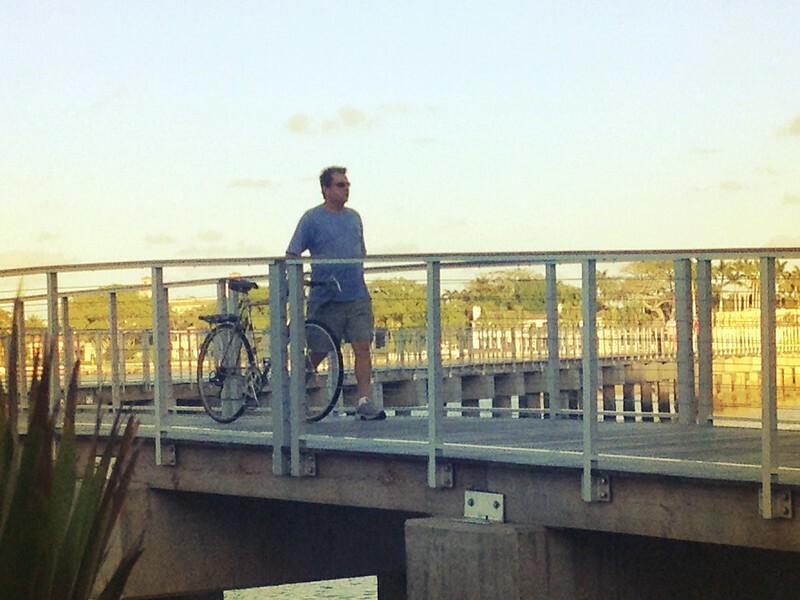 Raphael is actively trying to look for ways to influence his own neighborhood and improve it, whether it is bringing in new opportunities and new businesses into the downtown core, or fixing problematic areas for cyclists and pedestrians. 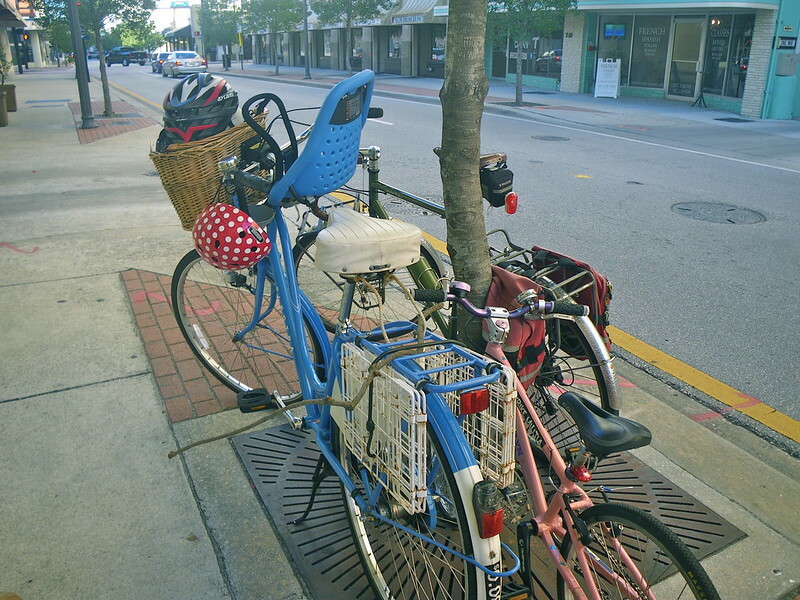 He brought in all new bike racks into Clematis so that there is more parking and now is spear-heading on-street bicycle corrals by replacing some on-street car parking. 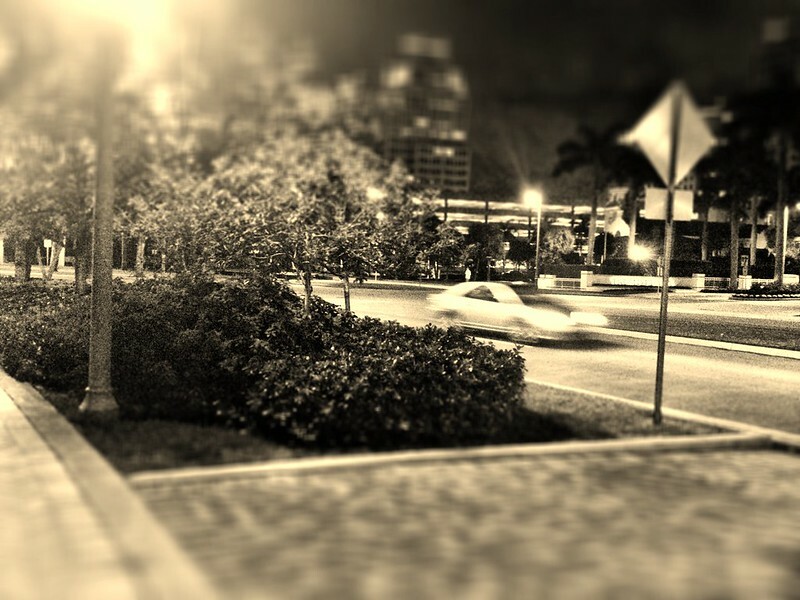 Slowly, he is chipping away at the car problem on Clematis and hoping that businesses see and reap the benefits. 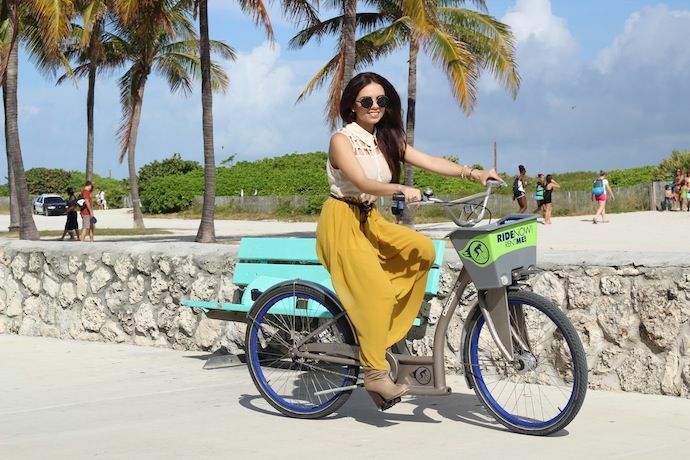 He is also leading the way to bringing the bike-sharing system DecoBike permanently to Downtown West Palm Beach and hopefully we can use it to market the downtown as a pedestrian and bicyclist friendly hotspot. Go Raphael! We are looking forward to a great 2013 and working hand-in-hand with you to advocate for continuing to improve our neighborhood! 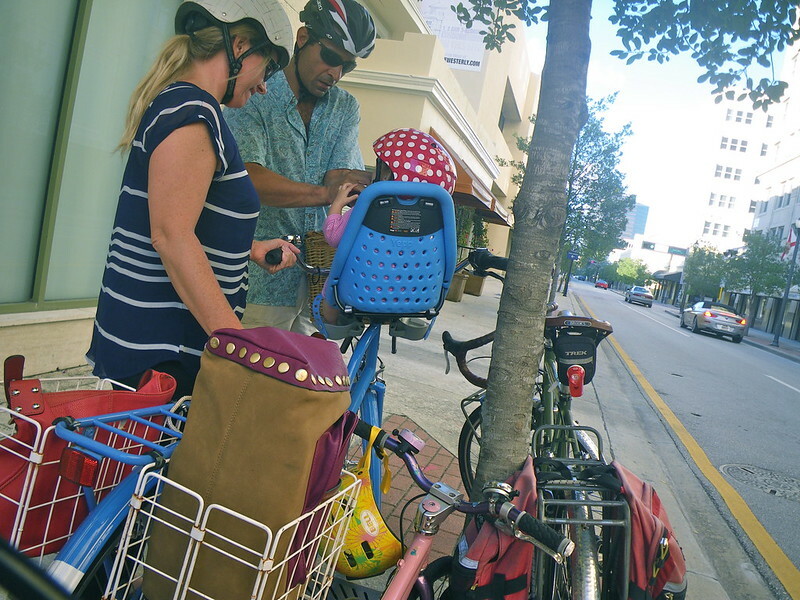 This is my favorite image and I think this highlights perfectly the bicycle-friendliness of Downtown West Palm: two happy cycling families. This guy was on an old English bike also with a child seat, and kept looking back like he wanted to ask us a question but didn't. He probably hasn't seen many bikes with the white fenders and full chainguards. 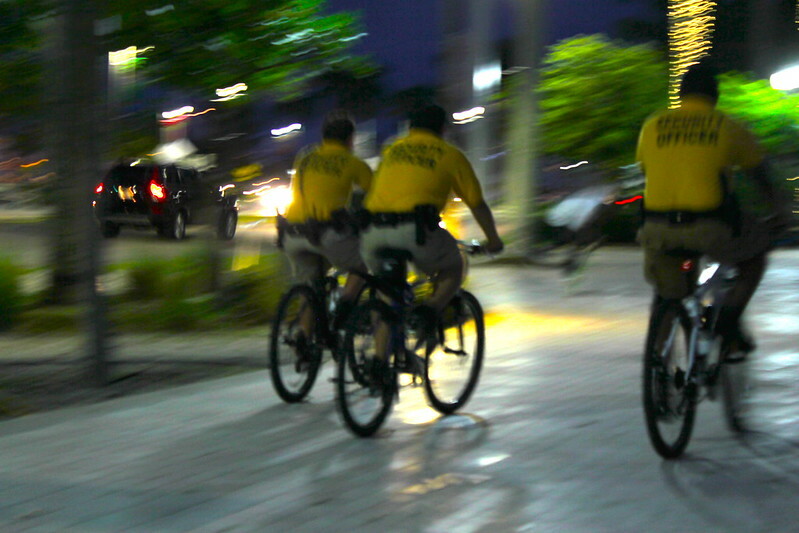 Our downtown security guards riding around on bicycles. 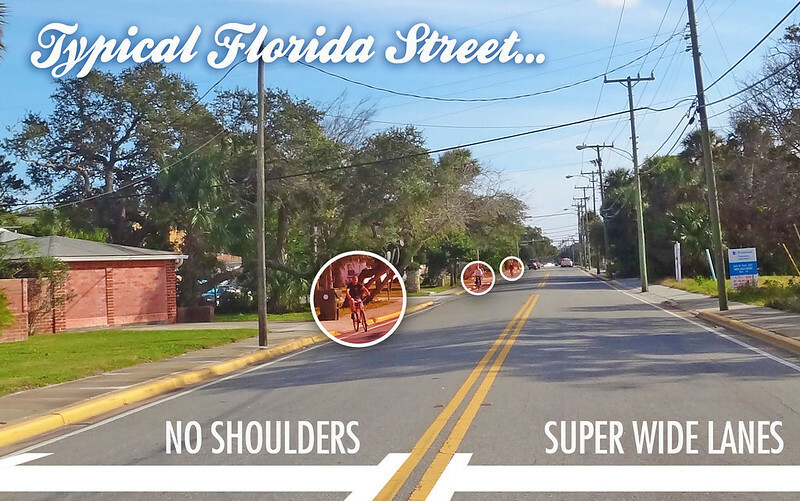 These are what typical stroads look like in Florida. 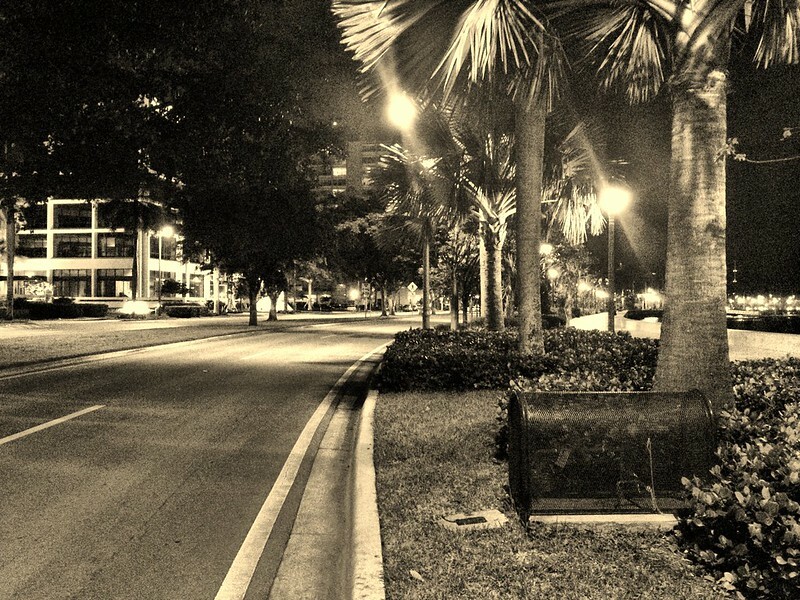 A stroad is the perfect abbreviated term for most of the streets/roads in Florida – they are all treated as personal highways. 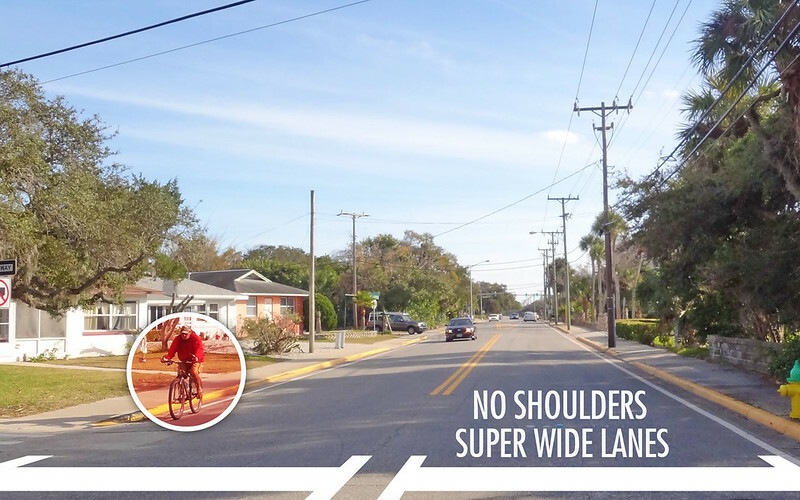 The travel lanes are often far too wide, encouraging highway-like speeding, have a lack of shoulders, narrow sidewalks in disrepair, and a plethora of open driveways all over the place. 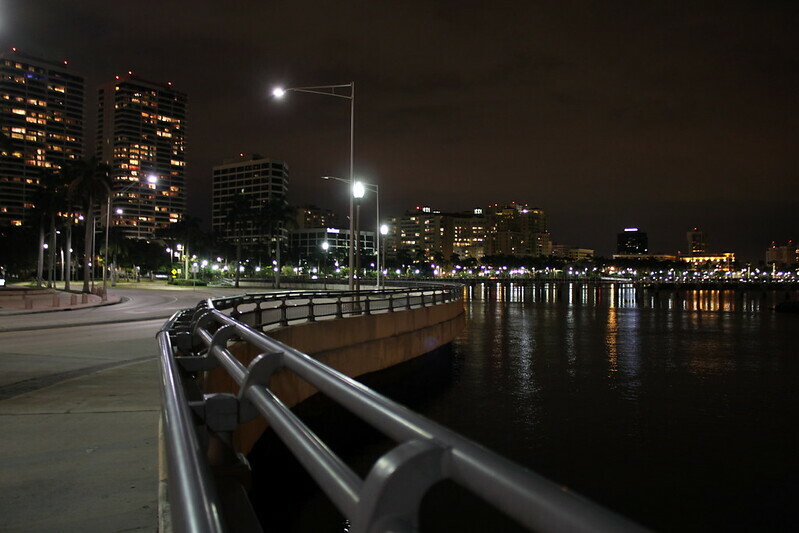 These pictures happen to come from the Daytona Beach/Indiatlantic area but really can be anywhere generic in Florida. They are indicative of the state of our old, crumbling infrastructure. Judging from the age of the houses, these areas were designed back in the 50s and 60s during the Car Boom, and as such, are prioritized for pushing through as much traffic as possible. Speed limits are 30mph but everyone can be observed going far beyond that. 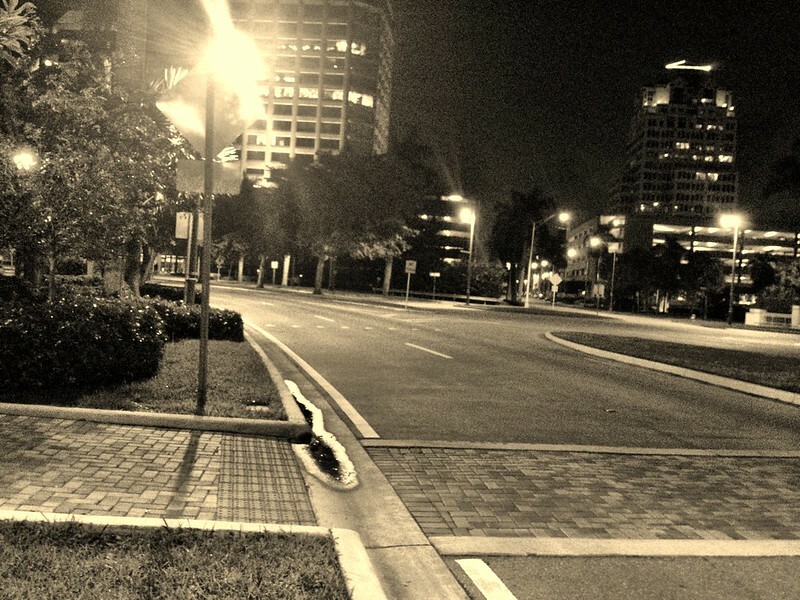 We have a problem where cars do not give the right-of-way at crosswalks. They blaze right through unless you are brave enough to stand in the middle and hope for the best. Rarely do they stop and let you pass. You can put up as many signs as you want and they don't do a lick of good. It's not a personal problem of ours. It's a problem that plagues the world. Here's a video example driving through Melbourne, FL of how no cars stop for the family waiting patiently at the crosswalk. 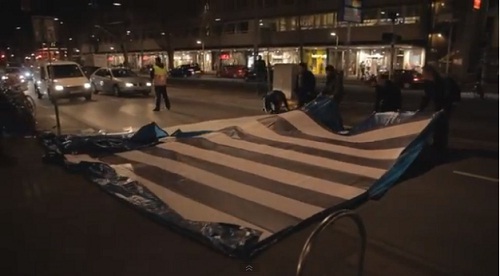 They are clearly visible in this scenario but nobody wants to stop. What is the point of the crosswalk if they have to wait for there to be no cars to cross? And that's the reason people jaywalk (which in itself is a made-up term by car companies in the beginning of the 20th century). Notice the shark teeth too in the road. 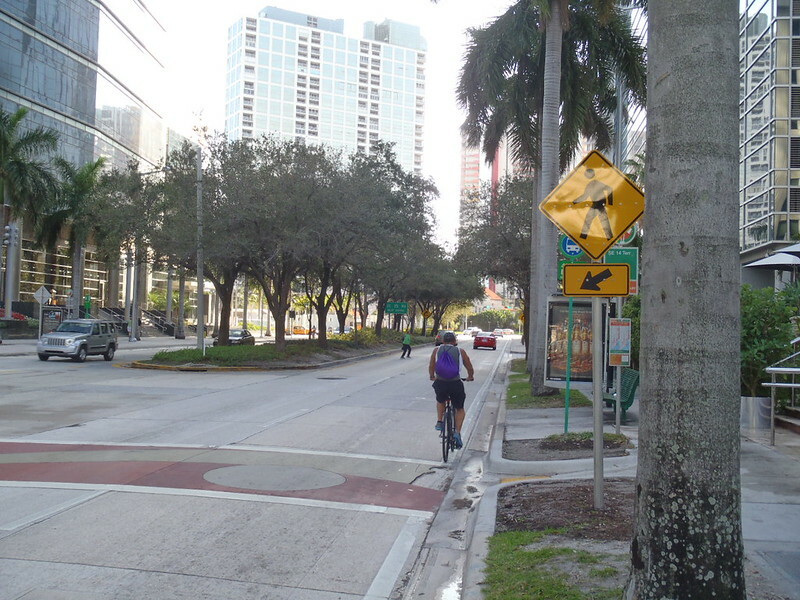 They are the yield line used in both the US and Europe to inform drivers where they need to yield and give priority to vehicle or pedestrian traffic, usually followed by a yield sign. Nobody yields. 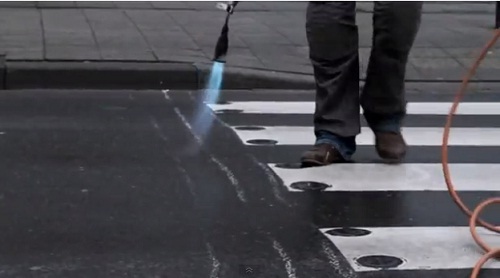 The coloring of the crosswalks is not useful towards improved visibility. 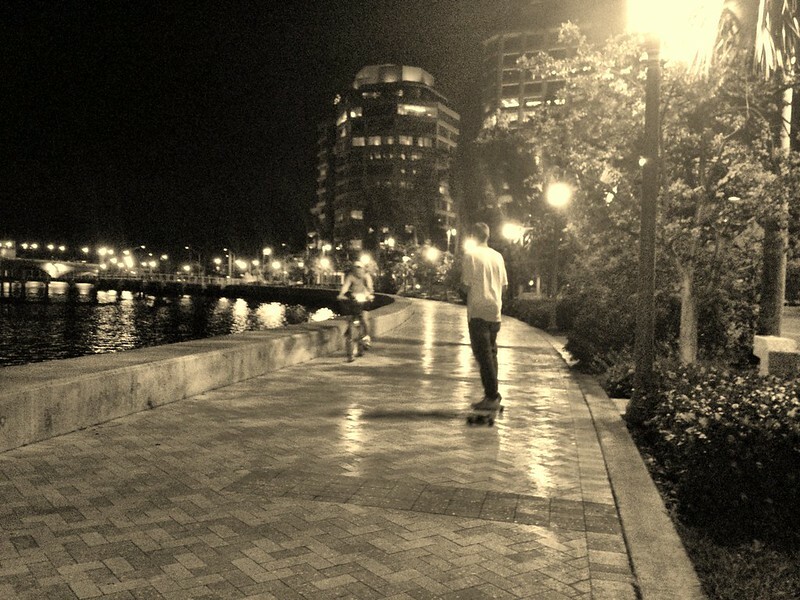 Pictures below are of our Flagler Drive in Downtown West Palm and especially at night, everything blends together so I made them a single color to highlight this. Notice below the shark teeth pointing out the upcoming crosswalk as well. I don't have big problems with the set up but I have personally run into instances where I am standing for long periods of time and not one car will stop until I start walking into the street. Or sometimes the visibility of coming cars is hard to see. 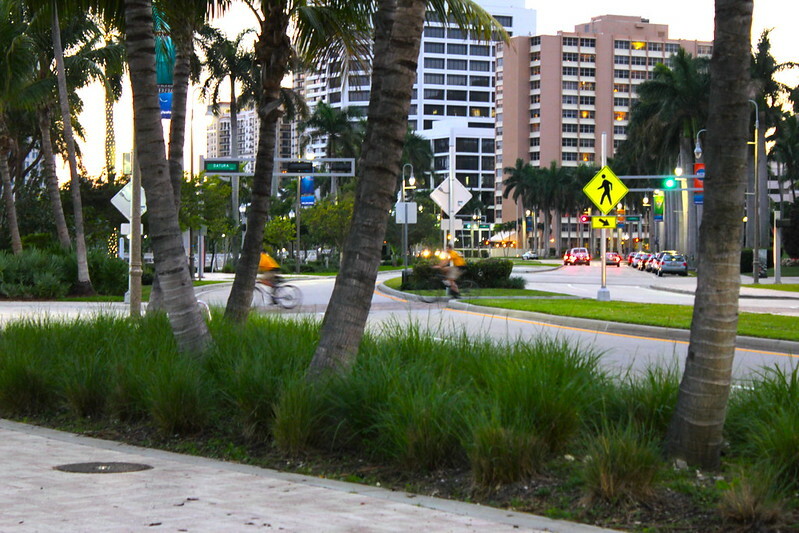 I could say vice versa for the drivers: pedestrians are hard to see amongst vegetation. Can barely see the next crossing sign up ahead around this curve. The visibility is also limited to only the yellow sign pointing at it. 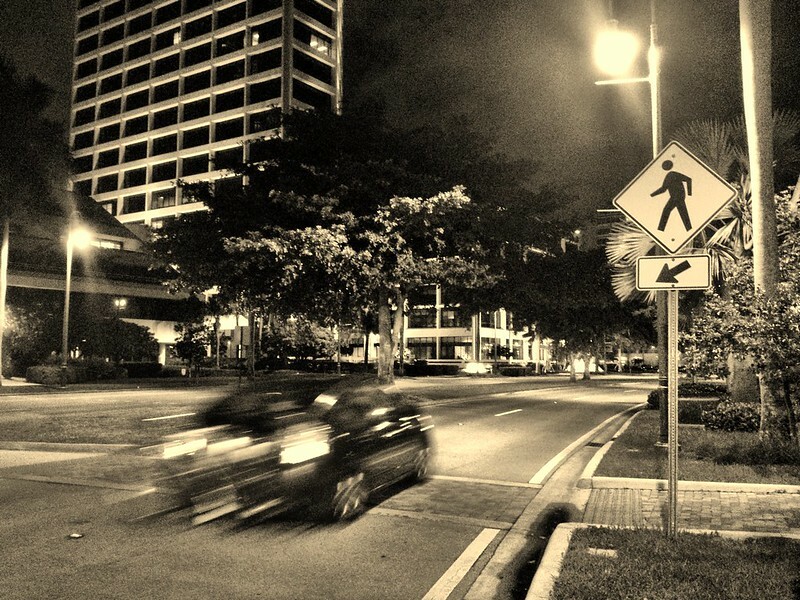 Cars won't see the pedestrian unless they are actively beginning to walk into the street. 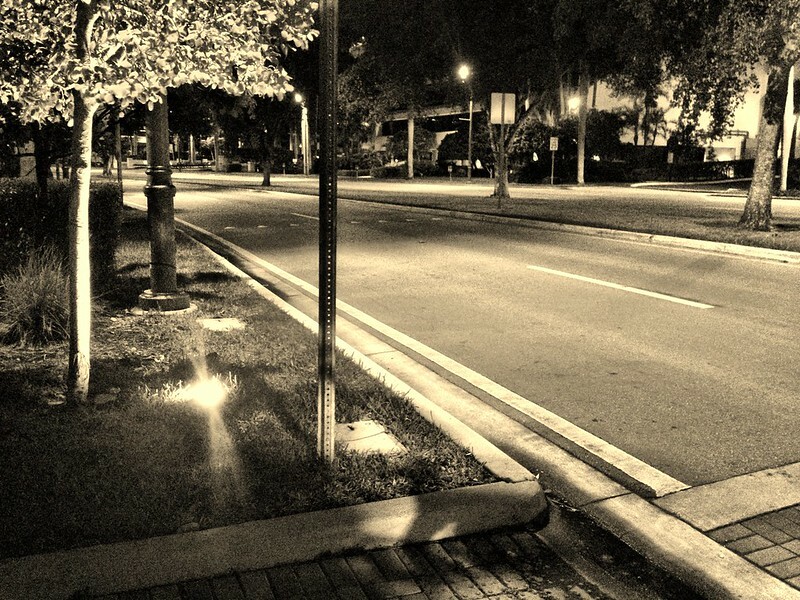 If we come up with lit-up flashing signs activated by a button, that might help to get the cars to stop without the pedestrian risking himself. 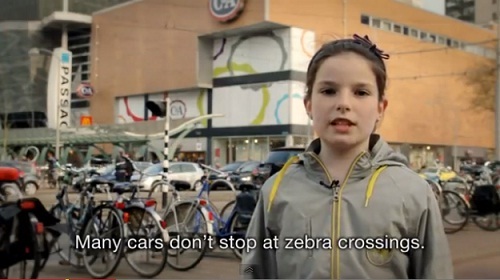 One solution is quite ingenious: IBM worked with a group of (of course, Dutch) children to come up with easy traffic solutions with simple and pure creativity. 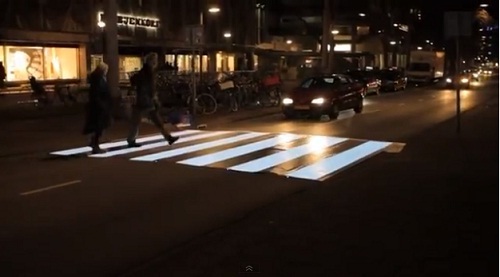 Then, working together with Ogilvy & Mather, they created flexible, flashing pedestrian crossings in the Netherlands. 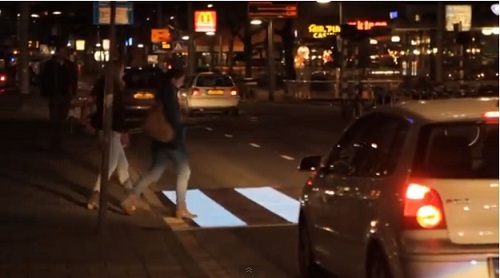 They are activated by someone stepping on them and emphasizing the importance of allowing pedestrians to cross. Result: cars immediately stop, at least in the Netherlands. Of course, this works best in the night-time. 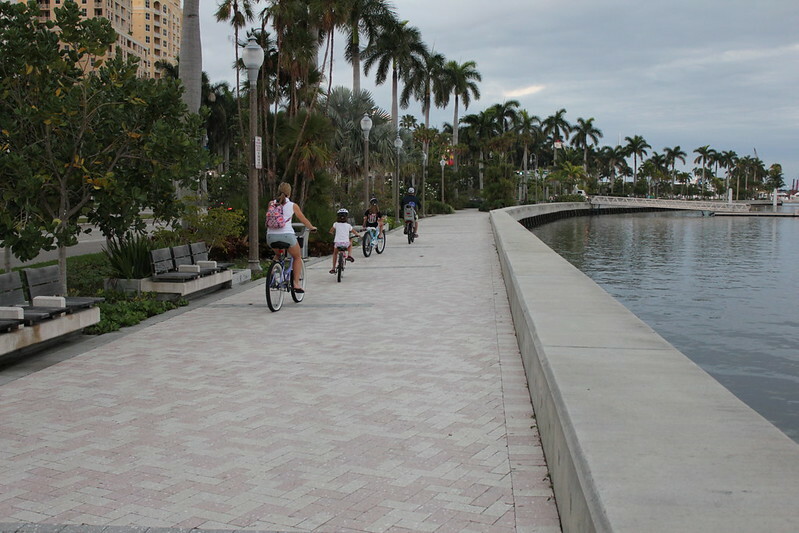 This would be great as a solution on Flagler Drive here in Downtown. US engineers would say it gives pedestrians a "false sense of security" and they are trying to say drivers here have no respect and they can't do anything about it. The case for separated cycling infrastructure is fraught with opposing arguments from motorists and this new term "existing cyclists." 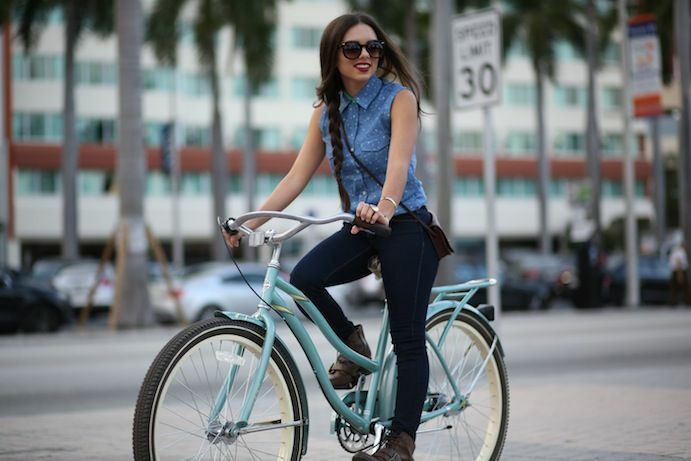 A lot of bike policies are based on taking into account "existing cyclists". What are existing cyclists? Mostly, what they refer to are the "road warriors"— cyclists who drive their bikes like cars in with normal motorized traffic. This isn't for the faint of heart. Sometimes you have to learn to be a road warrior in order to get around your neighborhood because of a lack of infrastructure if you insist on riding your bike. There are legions and whole squadrons dedicated to teaching people to be "Cycle Savvy" and how to ride with confidence with traffic so you don't get yourself killed with a mistake on your part. 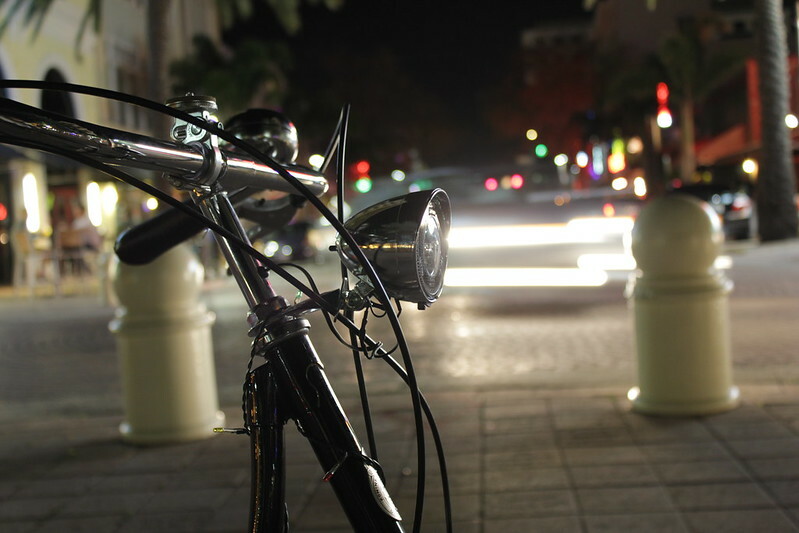 A mistake on your part is as simple as swerving to avoid something or falling off your bike. These mistakes can be death sentences. I personally feel that they provide a great education for how to cycle in an urban environment, but one can argue this topic to death whether or not bicycles are, or should be, part of traffic (in the US it means motorized traffic) and I don't feel that they are. Cars always travel, at a minimum, twice the speed and thus injury potential become that much greater. Pedestrians have protection from cars but cyclists, who are just as exposed and fragile, are given no provisions other than a cheap line on the road. 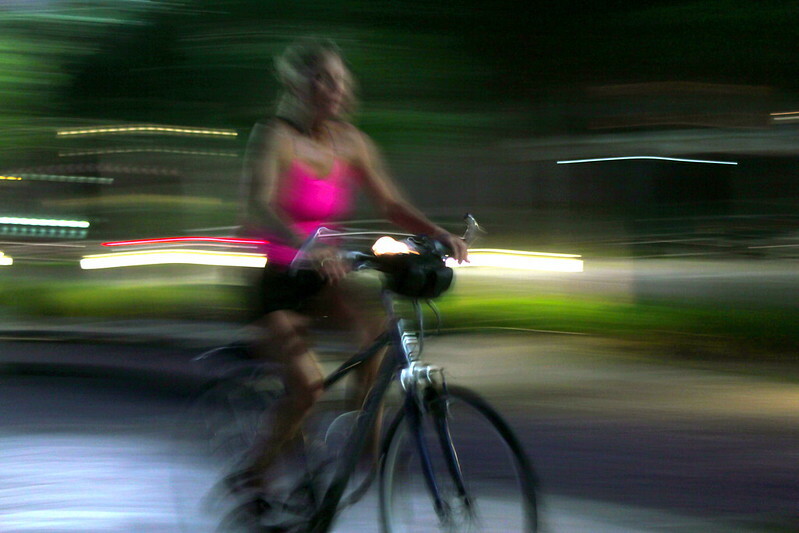 There's group rides like "Critical Mass" who try to educate drivers to share the roads, using large groups of cyclists to promote awareness for a population, but what it accomplishes remains to be seen. Miami hasn't accomplished hardly anything truly meaningful as a result of all of this exposure and all of these advocacy groups. 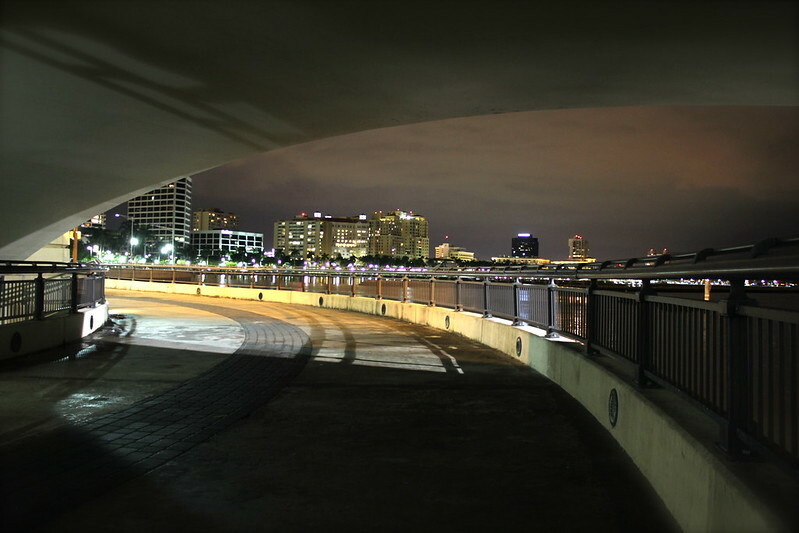 The City and FDOT just nod and do the opposite. Being a "Road Warrior" does not mean you have to wear lycra and ride a road bike or or be a fearless bike messenger. 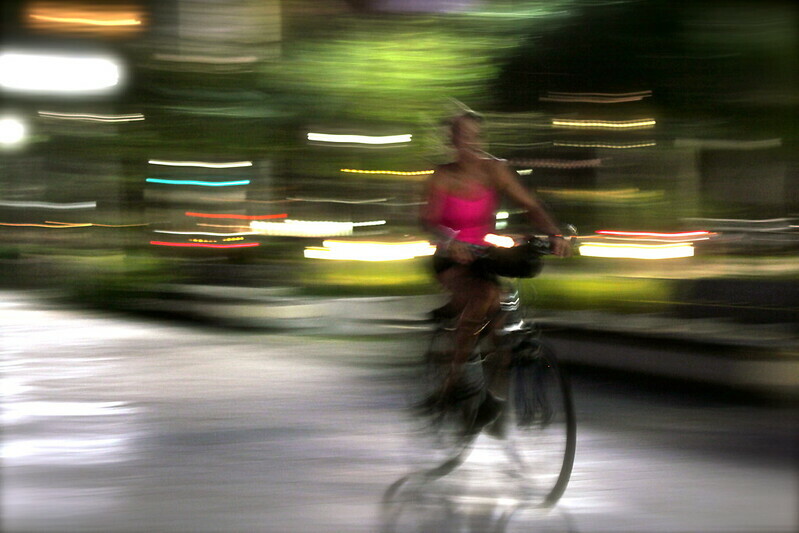 A road warrior is also a transportation cyclist. You do what you can to get from Point A to B in one piece and you get a sense of satisfaction every day of conquering the road and setting a good example to motorists of properly behaved cyclists so they stop stereotyping all of us as instantly irritating. Road Warriors are all about safety, so they don any number of accessories to decrease the motorists' capabilities of being able to claim that "they didn't see them. This includes, but is not limited to, helmets, reflective vests, flags, enormous amount of blinkie lights, bright clothing, mirrors everywhere including on helmet, and video cameras attached to helmets to record any altercations. They can be long-distance commuters or travelers so you will see tons of luggage and panniers strapped to the bikes with reflective bits. Sometimes they look like a circus on wheels but it gives them a sense of security. 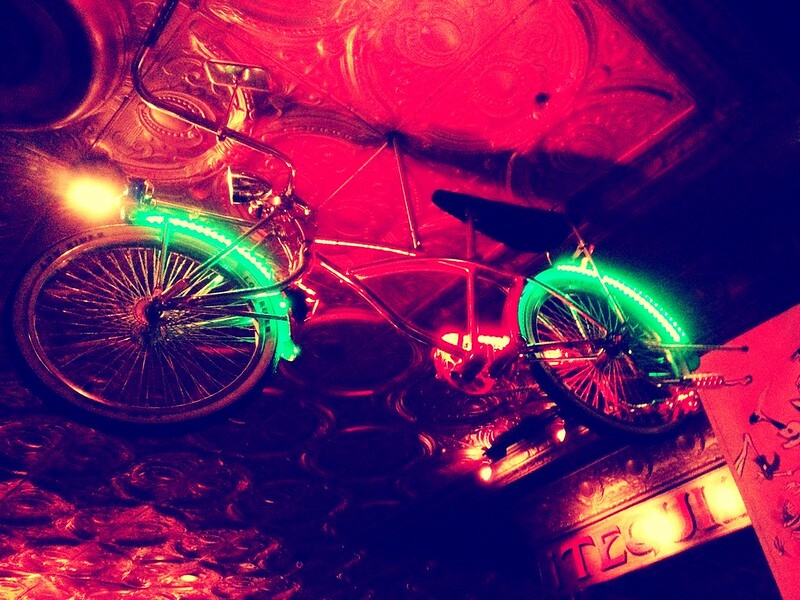 If they could, they would erect a steel cage around the bicycle. That's great and all when it comes to things you can control, which is very little compared to what responsibilities drivers of large vehicles have and it's evident that they don't respect these responsibilities half the time, as plagued by news stories. These existing cyclists attempt to argue that what's good enough for them is good enough for everyone else. They don't need the money spent on special lanes for them. They like riding with cars. Or another argument that irritates me is that "we have it better than a lot of places." With this mindset, you will never see increased cycling numbers because this is not the main group of people who ride bicycles. They are a fringe group that has just been adapting to their environment and collectively mourning whoever succumbs to it. 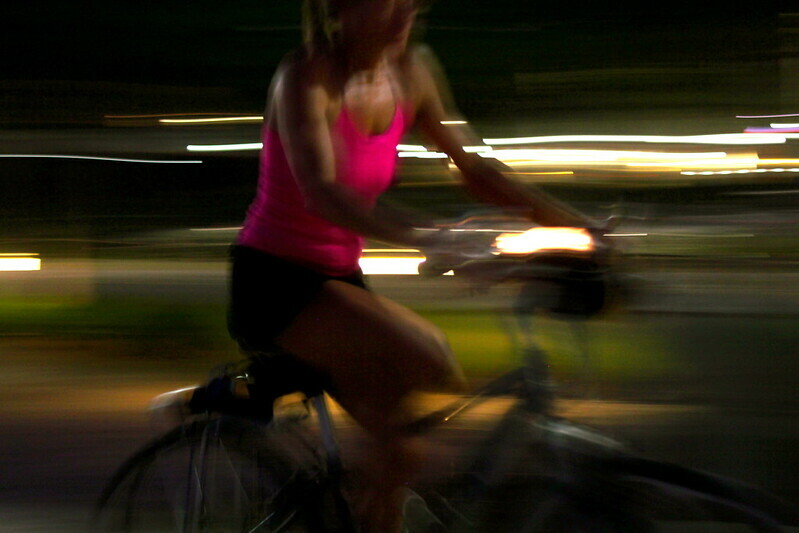 Their friends and family constantly bug them to be very careful or worse, stop cycling because it's unsafe. This group who thinks it's unsafe is the group that the special infrastructure would accommodate and they raise the cycling numbers. They are the other 99%. These are the "potential" cyclists whom leaders and planners need to target in their policies when it comes to bike lanes. 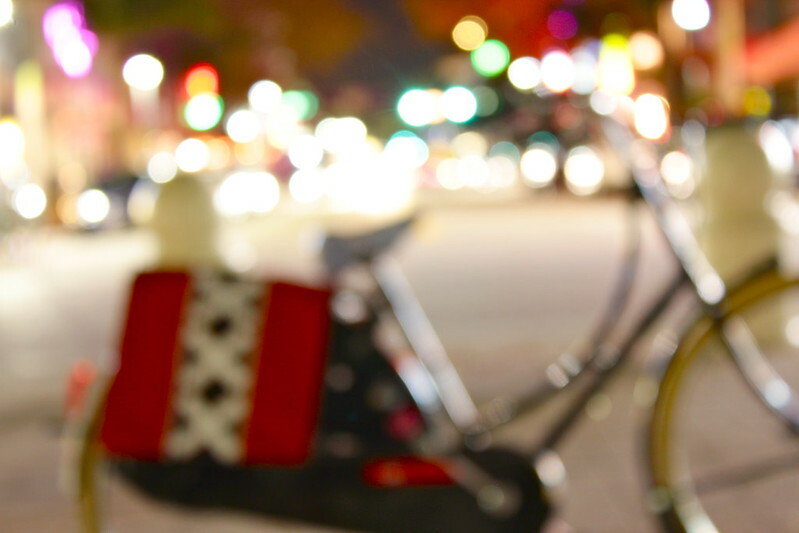 Occasionally you will see them on bikes but only where they feel safe. 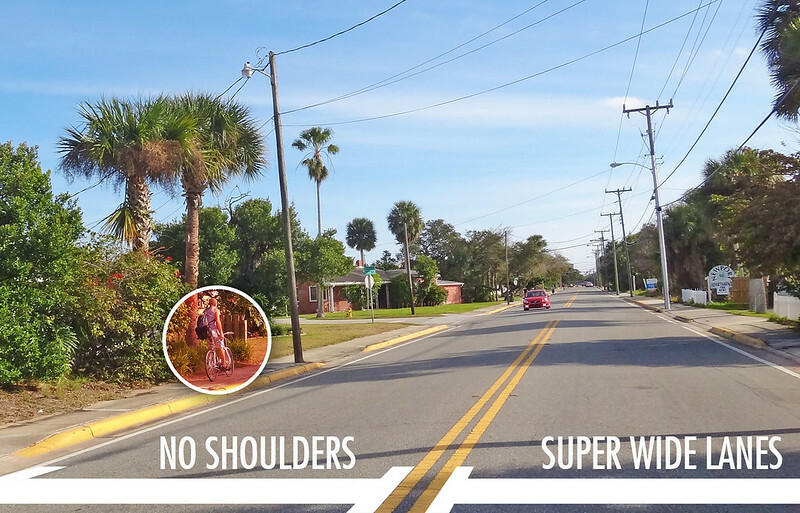 City planners should look to these potential cyclists to see where improvements can be made because they know they will be used. 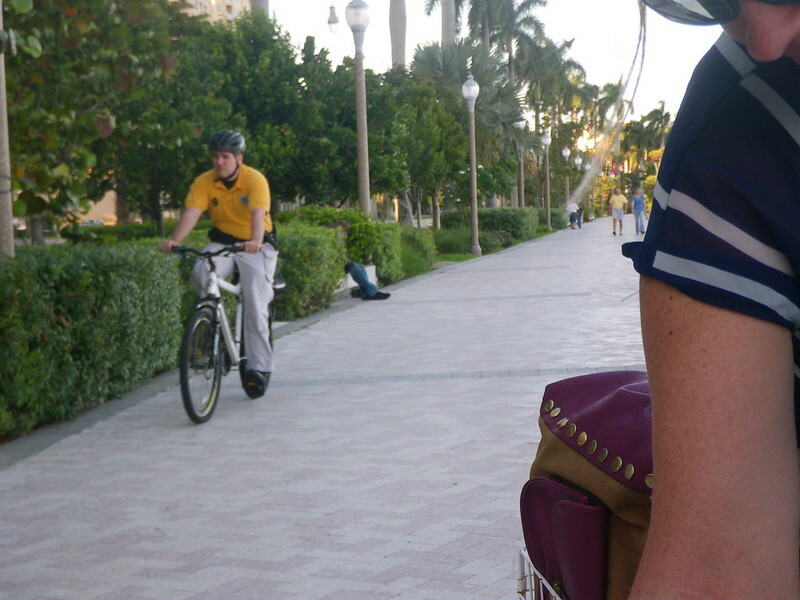 These are the infamous sidewalk cyclists. 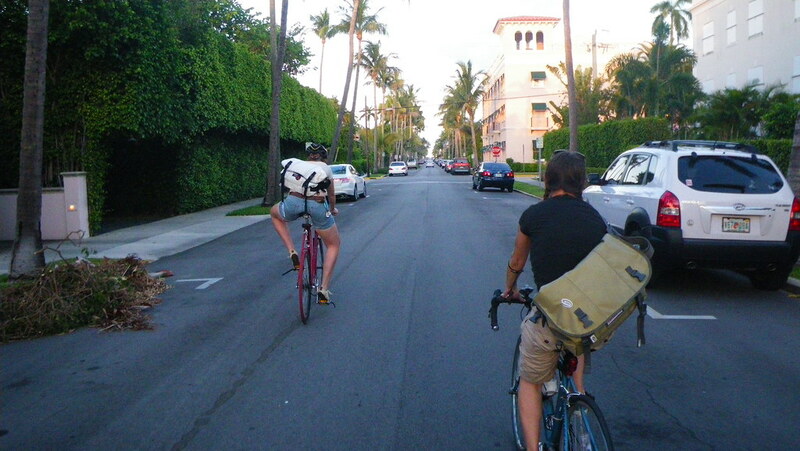 You can't pay them to ride in the street, much less use a cheaply painted bike lane the right way. Be glad they are out at all, at least getting exercise. 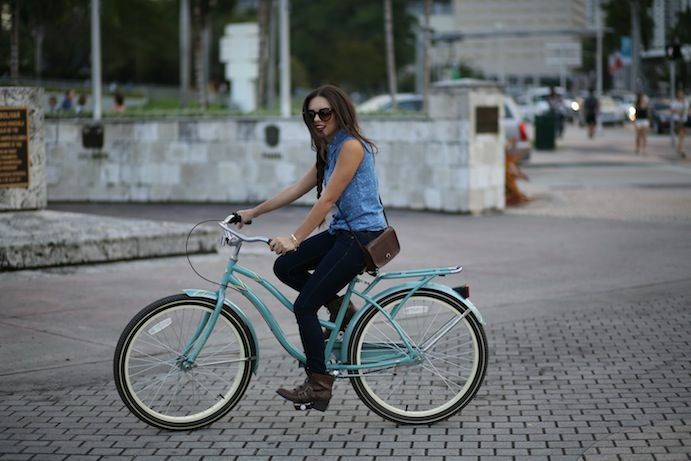 Mostly, cycling is a recreational hobby to them that has the potential to turn into active transport cycling if safer accommodations would be made for them. This is why I say they are "potential" because if they see cycling becoming more efficient and safe for them than taking a car to get around, they will bike. 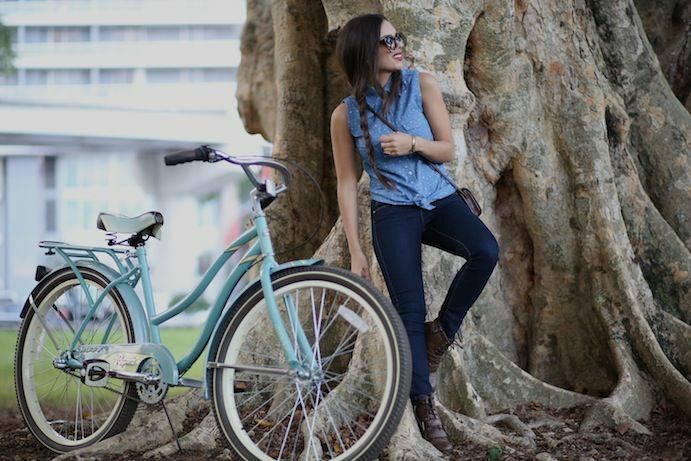 They will bike because they already love biking. With the relative flatness here and pleasant weather, it's a potential cycling paradise. 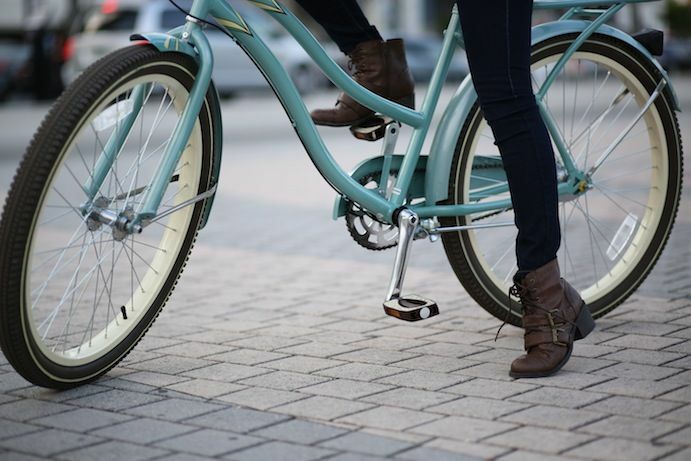 This group includes the elderly, families, and people with very short distances on relatively safe streets that can somewhat use the bicycle to commute. They wear helmets or they don't, but that's about as far as they go for accessories. They "should" have lights. 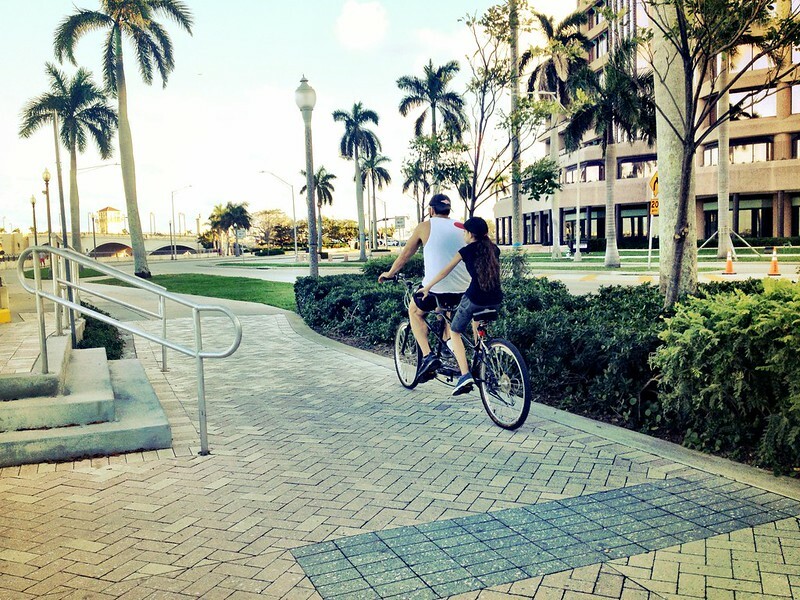 Riding on sidewalks is vastly inefficient and slow compared with street cycling, but they are hardly risking their lives, except maybe at crosswalks and driveways. Some of these sidewalk cyclists will ride in the street in the bike lane on the opposite side of traffic, known as salmoning, because they can see the traffic. It's a misappropriated sense of security and is a symptom of the lack of infrastructure conflicting with their desire to cycle efficiently (not on a sidewalk). So tell me, how many road warriors do you see out compared with potential cyclists? 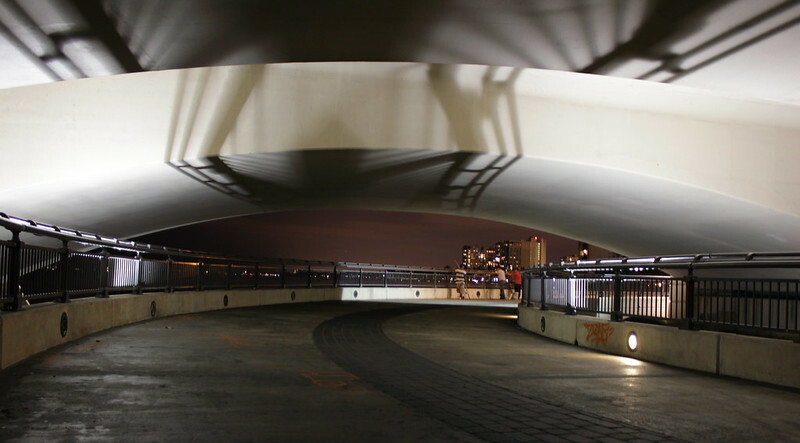 Who should planners base the cities' future policies on? 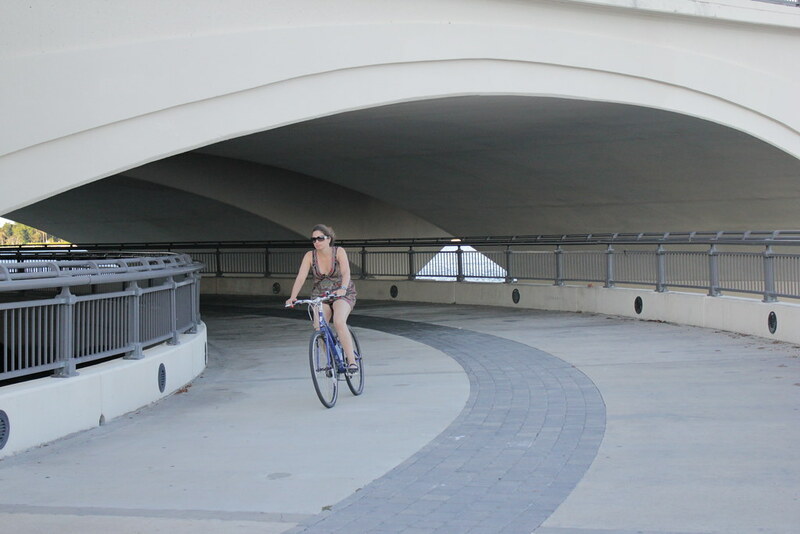 Better infrastructure to accommodate everyone and encourage exercise and a healthy connectivity to the neighborhood without risking your life or no infrastructure changes because existing cyclists learned to cope? 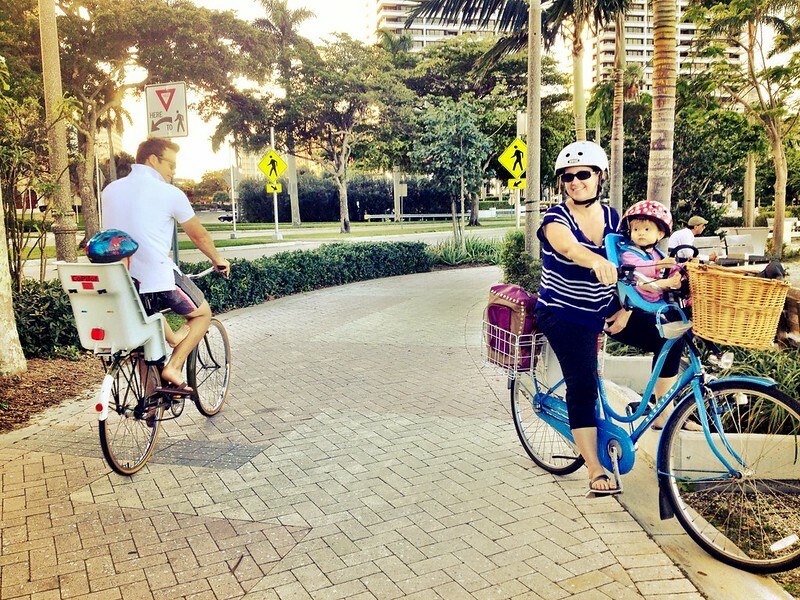 Are our little painted bike lanes on a street safe enough infrastructure improvements for this family? 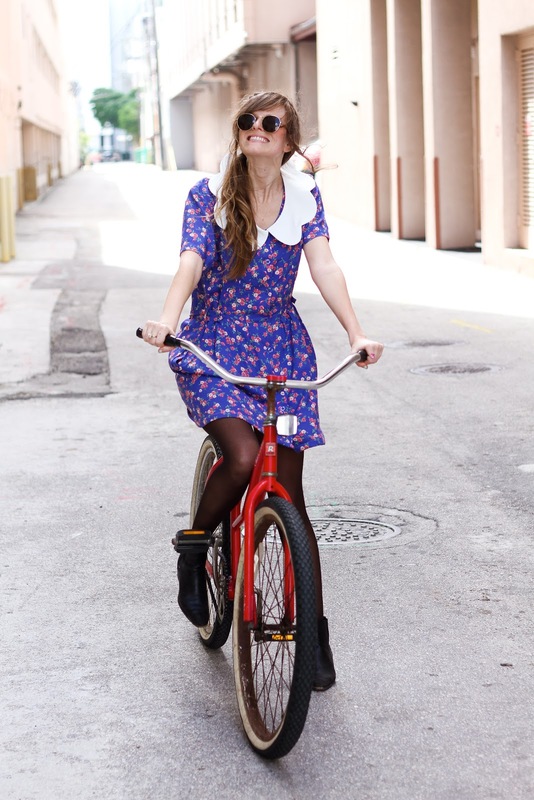 Or sharrows? These ladies are road warriors. They can ride fearlessly with cars. In reality, they'd prefer not to if they had the option. 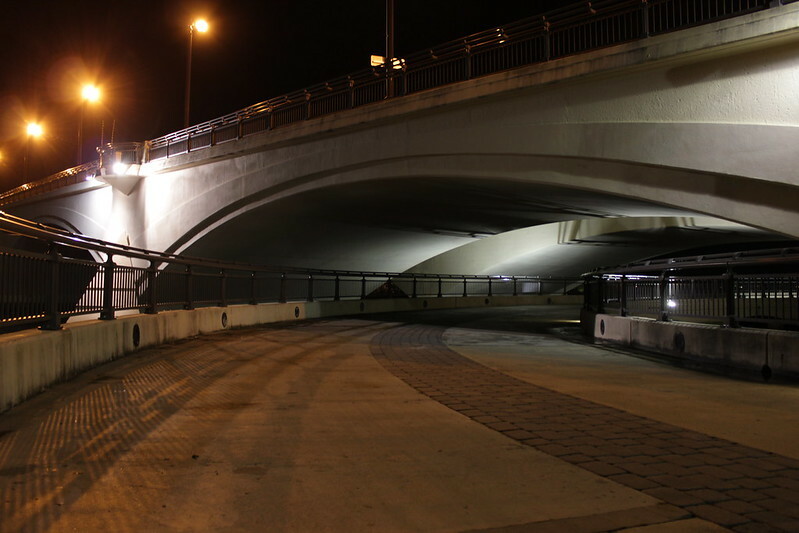 This ingenious extension of the Trail going underneath the bridge is brilliant. Do you think she would rather try to cross that intersection in the street? 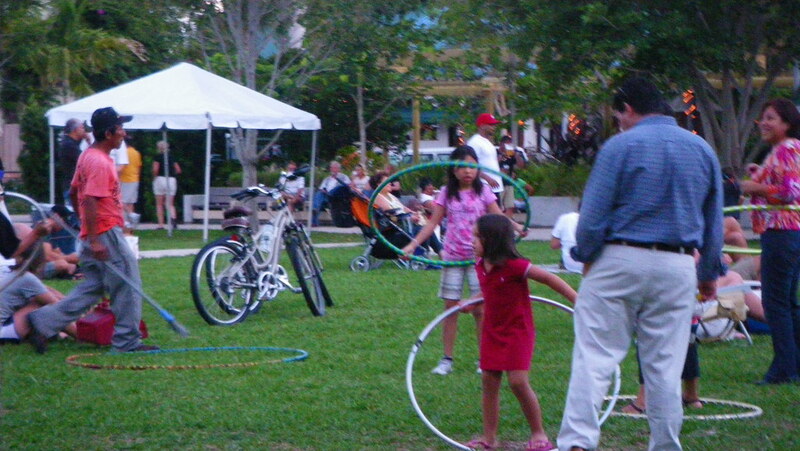 More families can enjoy the outdoors and come to the downtown via bike. Makes for a more vibrant community as a whole. 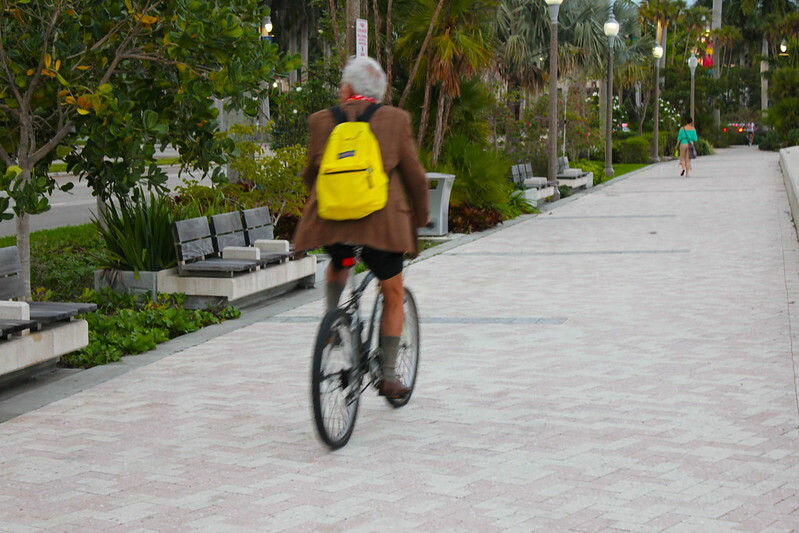 The man who pairs a tweed jacket with shorts and yellow backpack. We have downtown security riding around on bicycles. 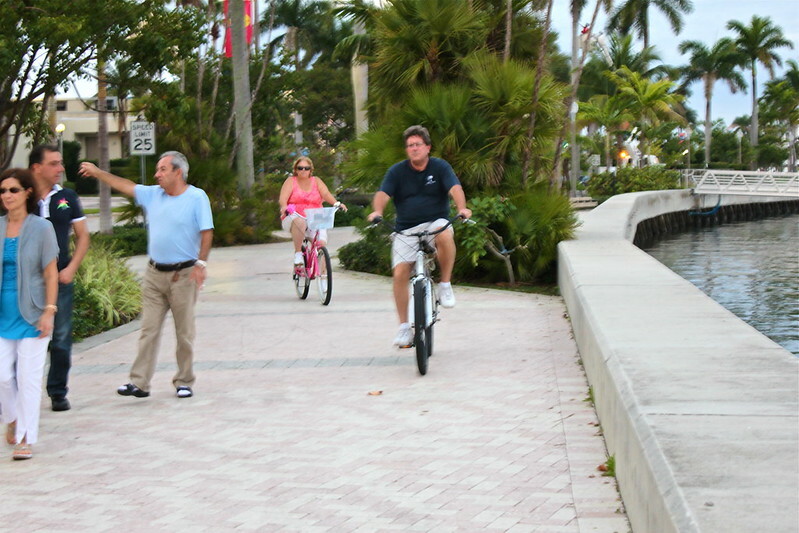 Here they are crossing one of the many pedestrian crosswalks along Flagler. Cars are supposed to stop. Most of the time, 95%, they do not. The design right now promotes speeding and separates the whole "access to the Waterfront" concept they spent so much money on. It's difficult to access when you have to constantly dodge 4 lanes of cars. 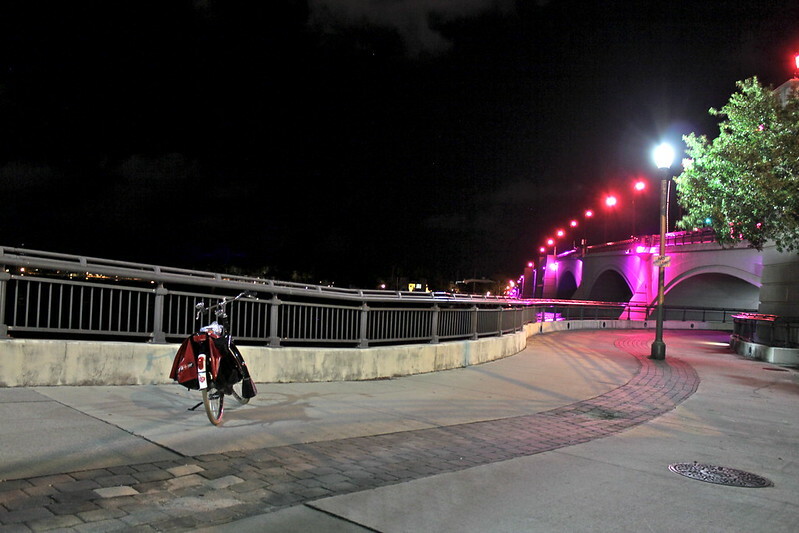 Waterfront (Multi-Use) Trail going underneath the Okeechobee Blvd/Royal Palm Bridge along the Flagler Drive seawall. This is one of the best designs for safe infrastructure, in my opinion, in the entire downtown area for cyclists and pedestrians. It allows safe passage without having to deal with trying to cross the mess that is that intersection.